Critically wounded, Rick leads a herd of walkers while he hallucinates people from his past and present -- uncertain if his own part of the story has come to an end. Maggie arrives in Alexandria to confront Negan. The citizens of Alexandria are on guard when Judith brings five newcomers to the town, and must decide whether or not they can be trusted. Henry and Carol depart the Kingdom to visit Hilltop, but are waylaid en route. 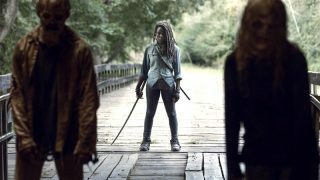 The communities are forced to regroup after discovering a group masquerading as Walkers -- and Michonne finds herself a prisoner. Negan must survive on his own after escaping is cell, and Hilltop sends out search parties to find their missing people.